As many of you may already know, King Henry VIII is my favorite monarch of the Tudor dynasty. If it wasn’t for his reign I do not believe the Tudors would be as popular as they are today. 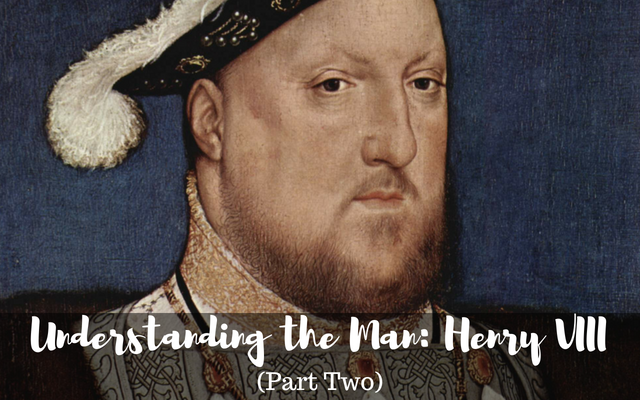 In this episode I continue on my journey to explain the Henry I have learned to love…and hate. With the creation of Showtime’s “THE TUDORS”, many of us were aware of the name Henry VIII but really didn’t know much about him. In the show we were able to see that there was more to the man than the execution of two of his six wives. 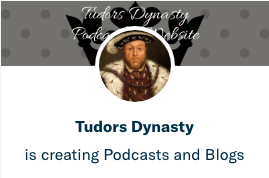 While I understand that “THE TUDORS” TV program had a bunch of historical inaccuracies, it also got people (like myself) to look deeper into the history by reading and absorbing as much as we possibly could. Over a decade later I feel like I have a fairly good grasp on the infamous king and would like to share my understanding of him with you all. Henry VIII was a man, well…maybe a man-child, but he wasn’t just the tyrannical ruler that many see him as today. There was much more to him than most understand. I hope with this series on his life that you will look at Henry in through new eyes. Henry VIII was a great lover of music, he had been described as having a great singing voice as well as being a good composer. During his summer progress of 1510, Henry entertained himself (and presumably others) by playing the flute, recorder and virginals. While some believe the King wrote Greensleeves there is no definitive evidence to confirm, however, we do know that he wrote “Pastime with Good Company”. Henry and his boon companions not only enjoyed music and dance but were known to dress in disguise and play games as well. Weeks after Katherine of Aragon had given birth to a prince, the King and a dozen companions “invaded” the Queen’s chambers one morning with hoods on their heads and with bows and arrows, swords and such to make them look like outlaws. The Queen and her ladies were bewildered by the site and after sometime it was revealed to them who the “outlaws” were. We see this again later on in life when Henry was preparing to wed Anne of Cleves, another time when he dressed in disguise – unfortunately things did not turn out as well for him that time…probably because Anne spoke little English and didn’t understand that this was something the king liked to do. From the beginning of his reign King Henry VIII understood the importance of having a male heir – he had known of the pretenders from his father’s reign and he began his own rule with a healthy paranoia. Good for the King it didn’t take long before his queen gave birth to a prince. Henry, Duke of Cornwall was born on New Year’s Day 1511. The excitement and joy of having a surviving child, let alone a son, less than a year after the queen’s first child (which was a stillborn daughter) was palpable. In celebration bonfires were lit and wine was given freely around the streets of London. It wasn’t only King Henry that was joyous over the birth of a son but all of England breathed a sigh of relief that the succession was settled so soon into the new king’s reign. In gratitude of the birth of a son, King Henry rode to the shrine of Our Lady at Walsingham on a pilgrimage of thanks. While there he made an offer of gratitude – what it was exactly I do not know. Unfortunately, the little prince lived for only fifty-two days. Katherine of Aragon was overwhelmed with sorrow, as was her husband. One can assume that Henry used his parents behavior after the death of Arthur as example by concealing his own feelings to comfort and be the strength for his grieving wife. The infant Duke of Cornwall was given a lavish funeral at Westminster Palace. Henry’s idea of grieving and moving past this awful loss was by keeping himself busy. As with any of us we grieve differently – this does not mean that he did not shed a tear for his lost son either. Many times people look at Henry as cool and calculating, with ice running through his veins. This is definitely not true. I’ve always seen Henry as sensitive and emotional. Here is an example: In a letter to Erasmus, sixteen year old Henry accounts for his great sadness at the loss of a man he idolized – King Philip of Castile who was Katherine of Aragon’s brother in law. Henry also grieved for the loss of his children. When Katherine of Aragon had a stillbirth or miscarriage, Henry was as saddened by the event as his queen. We all know that Henry VIII had affairs, however, one thing we will give the man is that for the most part he was discreet about them – with the exception of Anne Boleyn during his marriage to Katherine of Aragon. Unlike the French king, Francois I, Henry’s infidelities were kept to the time when his wife was pregnant or was recovering from pregnancy and he did not have an “official mistress”. We can look back at the twenty plus years he was married to Katherine of Aragon to see that most of his mistresses were during Katherine’s pregnancies – possibly with the exception of Bessie Blount who also gave him a son and was then “set aside” so to speak. Katherine of Aragon, like many English and Europeon queens before her “accepted such passing sexual adventures as one of the facts of life in a man’s world” – she did not need to look any further than her own father for an example of this behavior. Did Henry’s father have a mistress or mistresses? The only speculation that I have read would be his possible relationship with Katherine Gordon, wife of Perkin Warbeck, but again we don’t know for certain. Henry was a true Renaissance man – he enjoyed the arts and set out to attract as many artists and musician from abroad that he could. A Florentine sculptor by the name of Pietro Torrigiano was one of the first to arrive. Torrigiano was commissioned by Henry to execute the tomb of his father at Westminster Abbey. It appears that this talented artist had much in common with King Henry – some anger issues: “Pietro had permanently disfigured famous artist Michelangelo by a boxer’s blow on the nose; ‘I felt bone and cartilage go down like biscuit under my knuckles’, he said. Holbein was born in Augsburg in southern Germany in the winter of 1497-8. He was taught by his father, Hans Holbein the Elder. Holbein first traveled to England in 1526 with a recommendation to Thomas More from the scholar Erasmus. In 1532 he settled in England, dying of the plague in London in 1543. When we look at musicians during Henry’s reign the first that comes to mind in my head is Thomas Tallis. Tallis was an English composer and by 1543 was composing for Henry VIII. The Mary Imperial, the Falcon in the Fetterlock, Portcullis and Peter Pomegranate, in honor of the Yorkist, Beaufort and the badges of Aragon. Henry’s military campaigns began in 1511 when he joined the Pope’s Holy League against France. How predictable, right? Henry seemed to crave war and the notoriety that came with it – apparently winning a battle made him a more virile man, or something like that. While Henry was off claiming land in France his wife, Queen Katherine of Aragon (who by the way was pregnant at the time) was put in charge as Regent in her husband’s absence. This was the perfect opportunity (or so they thought) for King James IV to invade England. I often wonder if James IV had any idea of who Katherine’s mother was – or her father for that matter. One would believe that he would have known that she would not sit quietly and allow him to invade England under her watch. He paid for that mistake with his life. Henry wasn’t always successful in his military escapades and because of them he quickly depleted the royal coffers. The Dissolution of the Monasteries during Thomas Cromwell’s tenure helped to rebuild them for a short amount of time before he (yet again) went to war with France. Henry was quite the builder as well – I’m not sure of the exact number (may have been at least a dozen) but his builds compare to the most prolific monarch builder, King Edward I. The difference between the two men was that Henry’s building was done quickly – often making his men work overnight by candlelight and fires and so, because of this, many of his buildings no longer stand today. Pendennis Castle, located in Falmouth, Cornwall, England was built by King Henry VIII between 1539 and 1545 to guard and defend from the perceived French and Spanish threat. During the time that Pendennis Castle was being built Henry VIII married and divorced Anne of Cleves (1540), married and beheaded Katherine Howard (1540-1541) and married Catherine Parr (1543). He was a busy guy with building AND wives. St. James Palace was constructed between 1531 and 1536 and was secondary in Henry’s interest to Whitehall Palace. It was a smaller residence to help escape formal court life. Mainly built with red-brick, the palace’s architecture is primarily in the Tudor style. The most recognizable feature is north gatehouse; It is decorated with the initials H.A. for Henry and his second wife, Anne Boleyn. Interesting side notes: Henry’s son, Henry FitzRoy, died at St. James Palace as did his daughter Queen Mary I. It is said that his other daughter Queen Elizabeth I spent the night in St. James Palace while awaiting the Spanish Armada. In 1538, Henry VIII acquired Oatlands and rebuilt it for Anne of Cleves. In 1540 he married his fifth wife, Katherine Howard there. Oatlands Palace is where Queen Mary I retreated after her phantom pregnancy. It is when she moved from Hampton Court (which housed the nursery and nursery staff) that her subjects knew there would be no child. Little remains of Oatlands Palace, near Weybridge in Surrey, where Henry VIII loved to go hunting. The birth of Henry VIII’s legitimate son, Prince Edward, led directly to the destruction of the manor of Cuddington. To celebrate both the securing of the succession and the arrival of the 30th year of his reign, Henry decided to build a palace which would have no equal – hence the name, Nonsuch. None such palace would compare. It was said to be quite beautiful, and honestly like nothing England had seen before. Building for Nonsuch began in 1538. It was the greatest of Henry VIII’s building enterprises – it took nine years to build and was completed at a cost of at least £24,000, a phenomenal amount for that time. Henry died before the palace was completed. Henry VIII further improved the building to his liking by adding a Privy Gallery, a bowling alley, a tiltyard, a cockpit and real tennis courts. Hans Holbein painted many of the ceilings there as well. As per the book, London, Volume 1 (Page 339, Edited by Charles Knight), Anne Boleyn and Henry VIII were married at Whitehall Palace on 25 January 1533. Beaulieu Palace was the first palace Henry VIII built as King of England. In 1516, just a month before the birth of his daughter Mary, Henry ordered construction to begin. Beaulieu Palace was a favorite for Queen Mary I – her father, Henry VIII granted Mary the palace in his will. Beaulieu Palace is also where Mary I declared (before the sacrament) that she would marry Philip. Hampton Court Palace, from the beginning, was not built by Henry VIII – Henry received it from Wolsey in 1528. Once Henry owned Hampton Court Palace he began expanding to house his large court. He might as well have built it because the additions were major – Henry VIII spent £62,000 (approximately £18 million today) on Hampton Court in just ten years! In 18 months, Henry built three forts – one at Sandown, one at Deal and one at Walmer to cover that part of the English coast. They were built using press-ganged labor and stone from local religious houses that were suppressed by Henry’s Dissolution of the Monasteries. Notice how from above Deal Castle looks like the Tudor Rose. Henry VIII was in his late 40’s when he build these forts. Anne of Cleves is said to have stayed at Deal Castle after her long voyage from Europe on her way to London to meet her future husband. On 17 October 1521, Pope Leo X declared King Henry VIII the Fidei Defensor or Defender of the Faith. This title was given to honor Henry for his book “Defense of the Seven Sacraments” which attacked the theology of Martin Luther and was dedicated to Leo. Henry gladly took the honor and added it to his royal title, becoming: “Henry the Eighth, by the Grace of God, King of England and France, Defender of the Faith and Lord of Ireland”. After Henry VIII broke with Rome, Pope Paul III excommunicated Henry and rescinded the grant of the title “Defender of the Faith” in 1538. Of course, Parliament (or quite possibly Henry himself) would not acknowledge the ruling and the title remained. As the reform was spreading through Europe Henry fought against it, that is until his conscience got the best of him. After two decades of marriage and no surviving male sons he became convinced that his marriage was not favorable with God. While reading Sarah Gristwood’s book, “Game of Queens” she discusses two different debates regarding Henry’s concern with his first marriage. In the book of Leviticus, the Bible says, “If a man shall take his brother’s wife, it is an unclean thing: he has uncovered his brother’s nakedness. Thy shall be childless.” In Henry’s mind this meant not without child, but without male heir. Clearly he interpreted things the way that would benefit him. However, in the book of Deuteronomy it contradicts Leviticus saying that a man has a duty to marry his deceased brother’s widow and to ‘raise up seed for his brother’. So…which was it? Was Henry supposed to marry his brother’s widow or was he not? This is a topic I am always torn on – Henry was a deeply religious man…he was raised for the church and study theology feverishly. Maybe he truly believed that God frowned on this marriage. It’s easy for us to look at from the standards of today and say, “What a pig – he just wanted Katherine out of the way to wed Anne Boleyn!” Did he? He could have just as easily tired of Anne and moved on to a more willing mistress, right? In England, the Reformation began with Henry VIII’s quest for a male heir. When Pope Clement VII refused to accept a divorce or annul Henry’s marriage to Katherine of Aragon, Henry declared that he alone should be the final authority in matters relating to the English church. It has been suggested that Anne Boleyn provided the king with books that were banned in England due to heresy to convince him that she should not have to answer to Rome – he was anointed by God. Henry dissolved England’s monasteries to confiscate their wealth and worked to place the Bible in the hands of the people. Beginning in 1536, every parish was required to have a copy. After Henry’s death, England tilted toward Calvinist-infused Protestantism during Edward VI’s six-year reign and then endured five years of reactionary Catholicism under Mary I. In 1559 Elizabeth I took the throne and, during her 44-year reign, cast the Church of England as a “middle way” between Calvinism and Catholicism, with vernacular worship and a revised Book of Common Prayer. Now…when we look at the not so flattering side of King Henry we quickly recall that he married six times and that he executed two of his wives. It wasn’t only his wives that he executed but he also executed friends, like Thomas More and Thomas Cromwell – both deaths he regretted deeply afterward. Oh, and if you had any claim in your bloodline to the throne of England he’d also execute you. I have read that Henry VIII was responsible for possibly 72,000 executions during his nearly four decade reign. That number, in my opinion, is highly over exaggerated. If you consider the population of England during the reign of King Henry was 2.5 million people, that would mean that Henry executed about 2.8 percent of the population of England. Then we’d have to take into account how many people died of the plague and the sweating sickness as well as battles….there would be like….two people left. Okay, maybe a few more but you get where I’m going with this. There is, however, a list on Wikipedia of Protestants executed under Henry VIII…that lists totals sixty-three victims from 1530-1546. So while King Henry executed a lot of people, I definitely question the 72,000 number that has been floating around. Let’s go back to those with a bloodline that threatened Henry’s throne. It’s easy for us to look at his actions by the standards of this century, however, one must remember that Henry was only the second Tudor king to sit on the historically unstable throne of England. If there was any indication that someone was plotting to overthrow him Henry reacted quickly and decisively – let’s be honest, with England’s history with the Wars of the Roses he truly had to. I believe the first person who posed a threat to his reign was Edmund de la Pole. Edmund was the son of John de la Pole and Elizabeth Plantagenet, Edmund was nephew to Edward IV and future Richard III. After the execution of Edward Plantagenent, Earl of Warwick in 1499, Edmund de la Pole was the next Yorkist with a claim to the throne. Outwardly, de la Pole appeared loyal, however, he was upset when Henry refused him the dukedom after his father’s death. He was eventually executed in 1513. Then there was Edward Stafford, 3rd Duke of Buckingham – Henry had him beheaded. Stafford was charged with “imagining and compassing the death of the king,” through seeking out prophecy from a monk named Nicholas Hopkins regarding the chances of the king having a male heir. The evidence to back this up was supposedly obtained from disgruntled former members of the Duke’s household. Did he deserve to be executed? I don’t know, but at the time he was seen as a real threat and so Henry had to act. One of the executions that Henry regretted the most was Sir Thomas More’s. In my honest opinion I think Henry felt cornered on the matter and had to use More as an example to others who were refusing to sign the Oath of Supremacy and would not acknowledge Henry as supreme head of the Church of England. More stood by his convictions and lost his head for it. Lastly, another person whose heritage threatened the stability of Henry’s reign was Margaret Pole and her sons. Margaret’s life was marred by death – her father was executed by her uncle King Edward IV, her mother died when she was just a child and her uncle was Richard III – the king that died to make way for the Tudors. I believe, she is the oldest person to be executed at the Tower of London. Salisbury’s execution was private but that doesn’t mean there were not witnesses, it just means the number of spectators were far fewer than a public execution. Pole’s execution was wholly unnecessary and I believe it was used as a way to punish her son Reginald Pole for siding with the Pope during the Reformation. Of course those are only a few examples of notable executions during Henry’s reign – there were also family members like the King’s sister Mary who secretly wed Charles Brandon after the death of the her husband, King Louis XII – both she and Brandon were spared. Unfortunately, his niece Margaret Douglas (daughter of his sister Margaret and Archibald Douglas) was not as safe from the wrath of her uncle…but to be quite honest Margaret brought her imprisonment in the Tower on herself. Margaret took matters into her own hands and made a pre-contract for marriage with Lord Thomas Howard, younger brother of the 3rd Duke of Norfolk. As the niece of the King of England she was not allowed to choose her own husband. It was the right of the King to arrange a marriage that would be beneficial for the kingdom. She and Howard were sent to the Tower – Howard would eventually died there after Margaret was released. The fear was that Howard only wished to wed Margaret because he knew was the only legitimate member of the family in the line of succession. Henry allowed the bible to be translated into English – this, for the sixteenth century was quite controversial. In his Act of Succession he allowed his two daughters to follow his son. His daughter Mary became the first queen regnant in English history – quite magnificent actually. Henry VIII was considered the founder of the English Royal Navy and helped to grow the number of ships within it exponentially. In my mind it’s easy to justify Henry VIII’s actions. As King of England he was responsible for all those who resided there – the choices he made were not only for him but for an entire country. It’s easy to make judgement on a man for his actions, but I don’t believe it’s fair to judge him by today’s standards. If we take a step back and situations and looks at what was going on during the time it should help us understand a little better why he did what he did. We must also remember the constant pain he was in from the festering and smelling ulcers on his leg. I know I would be quite cranky and moody if I was in constant pain. I agree, not all his actions were justified – but let’s be fair…the main reason so many know his name is because he married six times and had signed the death warrants to have two of his wives executed. Want to hear more podcast episodes? Click the image! Good summary. I’m a fan of Henry VIII, too, with many books in my library. For those who thought him paranoid about his crown, it’s important to note history as Henry saw it: Richard II overthrown and murdered; usurper Henry IV faced numerous rebellions; Henry VI overthrown and murdered; usurper Edward IV overthrown by rebels; Richard III killed by rebels; usurper Henry VII faced several rebellions. That history would give me pause for thought.